The library isn’t floundering. Rather, it’s flourishing, putting out some of the most innovative online projects in the country. On the stuff you can measure — library visitors, website visitors, digital gallery images viewed — the numbers are up across the board compared with five years ago. On the stuff you can’t, like conceptual leadership, the NYPL is killing it. The library clearly has reevaluated its role within the Internet information ecosystem and found a set of new identities. Let’s start from here: One, the New York Public Library is a social network with three million active users and two, the New York Public Library is a media outfit. The library still lends books, but over the past year, the NYPL has established itself as a beacon in the carcass-strewn content landscape with smart e-publications, crowdsourcing projects, and an overall digital strategy that shows a far greater understanding of the power of the Internet than most traditional media companies show. Everywhere you look within the New York Public Library, it’s clear that the institution has realized that its mission has changed. It’s no longer only a place where people take out books and scholars dig through archives. The library has become a social network with physical and digital nodes. That’s probably not news to many who have their head up and looking around for ideas and success stories from libraries. What struck me most about this article was the casual use of the term ‘crowdsourcing’, as if it is one in common use today. Actually, it isn’t that common among libraries – yet – and you’ll even have to Add ‘crowdsourcing’ to your spell checker. As usual, I searched the Internet for leads to ‘crowdsourcing’ information, and our good friends at Wikipedia didn’t disappoint. “Crowdsourcing is the act of outsourcing tasks, traditionally performed by an employee or contractor, to an undefined, large group of people or community (a “crowd”), through an open call.” Wikipedia also has an alphabetical list of about 80 crowdsourcing projects provided for the person interested in researching the possibilities. The page lists everything from “Australian Historic Newspapers provided by the National Library of Australia encourages members of the public to correct/fix up/improve the electronically translated (OCR) text of old newspapers.” to “Zooppa is a global social network for creative talent that crowdsources advertising. Founded in 2007, Zooppa partners with companies to launch brand sponsored advertising contests.” and lots more interesting applications of crowdsourcing. Coincidentally, I recently met Ellen Forsyth, a librarian from Australia visiting the USA. She is a library consultant with the State Library of New South Wales, and she told my colleagues and me about this crowdsourcing project and how it had proven highly productive and a catalyst for public support for the library. The term was “first coined by Jeff Howe in a June 2006 Wired magazine article “The Rise of Crowdsourcing“” as a combination of ‘crowd’ and ‘outsourcing’. But, the concept of crowdsourcing has been around since at least the turn of the century [I love saying that. ], unless you count Project Gutenberg’s distributed proofreaders crowdsourcing, which has been around longer. The point is that incorporating this technique into library offerings is a new 21st Century Library skill that more libraries need to adopt. We have heard and read that libraries must evolve from passive providers of access to books to something more. Fall 2009, the Institute of Museum and Library Services (IMLS) launched its 21st Century Skills initiatives with a 40 page report titled “Museums, Libraries, and 21st Century Skills” [Citation: Institute of Museum and Library Services (2009). 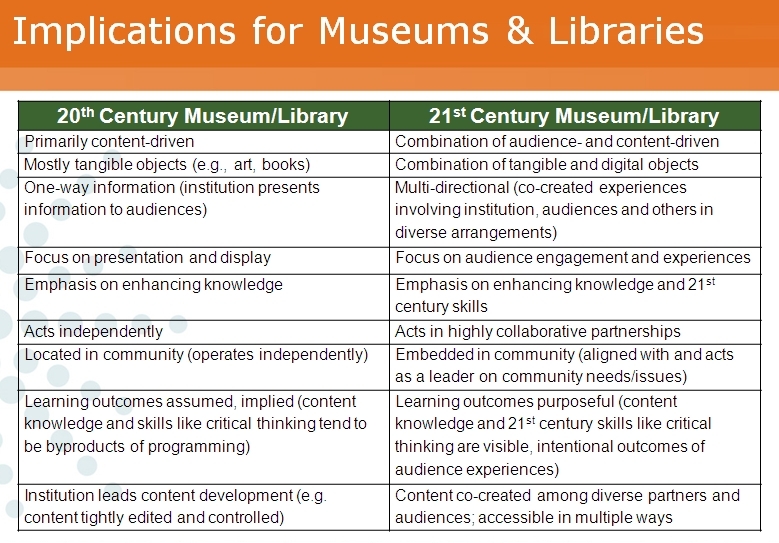 Museums, Libraries, and 21st Century Skills (IMLS-2009- NAI-01). Washington, D.C.], in which the Institute provided this appeal to the library profession. • Design new programs and strategies to help individuals meet the new and more demanding challenges of 21st century life. Crowdsourcing is a new 21st Century Library skill from which every library and community can benefit. However, crowdsourcing is not without its potential pitfalls. The Chronicle of Higher Education reported June 14 that Civil War Project Shows Pros and Cons of Crowdsourcing. The University of Iowa is the latest to use crowdsourcing to let anyone online help do work once reserved for scholars and archivists—in this case, inviting volunteers to transcribe a trove of Civil War-era diaries. … traffic spiked suddenly last week, when the project was featured prominently on Reddit, a popular blog in which users post and vote on interesting Internet links. The site received over 32,000 unique hits—30 times its usual traffic for the week … the rush of users crippled the Web site for a day. “Once the site started to get that much traffic, pretty much you couldn’t get to anything in the digital library,” Mr. Prickman said. Staff members have spent more time checking the work of volunteers than they would have had to do if they had hired professional transcribers, Mr. Prickman says. But it has not been an excessive amount of time, and the cost-savings have made the project possible, according to Mr. Prickman. “I think we’ve also come to recognize some ‘power users’ who transcribe in great quantity with high accuracy,” he wrote in an email. … Sharon Leon, director of public projects at the Center for History and New Media at George Mason University, who is conducting a similar crowdsourcing project in which volunteers transcribe handwritten documents from the now-defunct U.S. War Department of the 1800s. Sounds like a problem most libraries would love to deal with – too much help. Crowdsourcing is a new 21st Century Library skill from which every library and community can benefit. Find good examples and ask for advice from those who have tried it and succeeded at getting their community involved in their library. “A visionary strategic plan is monumentally important to becoming a good library, but it is critical to providing a library that is highly relevant to a 21st Century community. Becoming a highly relevant library in the future environment of your community is venturing into totally unknown territory because there are so many unknown and unfamiliar factors and influences involved as stated throughout this book. Since these factors and influences are changing so rapidly, attempting to accomplish the necessary goals and objectives of a 21st Century library without a strategic plan is unimaginable. Where would you begin? What activities would you select to receive those critically limited resources, or would you just allow staff to randomly do their own thing? How will you know when you’ve achieved any goals or objectives leading toward your mission? Our book is now available from Libraries Unlimited. Visit their website for more information and an opportunity to order the book. Thank you for your interest and support of the 21st Century Library Blog. A 14 year old entrepreneur from Spanish Fork, Utah used resources from his local public library to create the #1 hottest app on the Net – Bubble Ball. ABC reported the story this past weekend. • The Perfect Storm – Today’s economy creates favorable conditions for sale-leaseback sellers. • Has the NCAA set the conditions for the Perfect Storm? IMHO, there are “perfect storm” conditions at the front doors of libraries, threatening to devastate them. Technology – Advances in technology are faster than librarians can learn. When they do learn to use the technology, it takes time, talent and funds to apply them to a real world issue regarding library services to 21st Century customers. Technology is a bullet train with no stops that is affecting decisions regarding both services and collections. Customers – Changes in customers’ behavior are creating vastly diverse and somewhat unpredictable demands for library services. Technology literacy levels among library customers are vastly different and constantly evolving. Digital Native customers and Digital Fugitive customers are at opposite ends of the customer service spectrum, but both deserve excellent library services. Economy – The depressed economy that began two years ago has impacted library funding dramatically. No library system is immune to funding cuts, no matter how excellent the service or community support. Non-existent tax revenues can not fund libraries at the old levels, and trying to improve services and technology is nearly impossible with reduced funds that often are insufficient to even keep the doors open as long as before. Relevance – Due to all the other economic and day-to-day issues that also batter individuals, library supporters are disinterested in the survival of their local library. Too often librarians hear that dreaded question – “Why Are Libraries Needed?” Libraries are no longer the sacred cow that is untouchable, but merely another public service agency funded by diminished tax dollars that must fight to have its value to the community recognized. Library’s Role – Unfortunately, when external influences impact the librarian profession what usually happens is a procrastinated debate over the age-old issue – “What is the role of the library?” Some contend that the library’s role has never and will never change – providing equal access to uncensored information. Others contend that commercial organizations are far exceeding the library’s ability to fulfill that role, so libraries must adapt and re-invent themselves in order to remain relevant to their community. The uncertainty within the profession fosters no decisions, no actions and no direction, which results in the further devaluing of the library’s role. Library Education – Academia is slow to adopt new theories and techniques to incorporate into cutting edge curriculum for the profession. Therefore, librarianship education is well behind where it should be to provide MLS graduates with the latest strategies for implementing technology in library services, thus prolonging the lack of change and evolution within the profession. This “perfect storm” of combined external factors contributes to create a disastrous environment for libraries. Libraries are being battered and torn by these factors almost to the point of destruction. If one considers all the branch closings and cut backs in staff, services and hours, and for-profit companies managing public libraries, then the storm damage is severe. A forecast for better conditions is not in the near future. The reality is that in order to withstand the “perfect storm” that is attacking libraries, one should have boarded the windows (figuratively, not literally), stocked up on emergency supplies, and definitely learned how to swim. In other words, the solution to surviving this storm was in recognizing that it was coming, but very few did. Unfortunately, no early warning system existed (although in hindsight it definitely should). Libraries have to find their safe harbor – their niche in their community – and apply every safety measure they can find (technology, business acumen, innovative librarianship, advocacy, etc.) to weather this “perfect storm”. When the storm passes, will your library still be standing, or will it have to be rebuilt? Will your community have the desire and resources to rebuild? Will your community have confidence in you to rebuild, or will they question whether your inability to save the library was part of the problem? So, do I think I can give you the answers to this ill-defined notion? Not hardly! Now more than ever, there are additional skills and broader knowledge required for librarians to be successful, much more than is taught in Schools of Library and Information Science (SLIS). Keep in mind that I said “additional skills and broader knowledge”, but what SLIS focus on is the librarianship theory. Masters level education is virtually all theory based, which is highly important, but not all encompassing. My most favorite “truism” I learned many years ago was that: “Theory without practice is empty and practice without theory is blind.” [Kidd, J. R. (1973). How Adults Learn. New York: Association Press.] In other words, an MLS is not enough to be successful as a 21st Century Librarian. Today’s librarians require additional skills, most of which won’t be taught in SLIS. • Set up your own blog, locate a few useful library related blogs and/or news feeds. • Explore Flickr and learn about this popular image hosting site. • Have some Flickr fun and discover some Flickr mashups & 3rd party sites. • Learn about RSS feeds. • Play around with an online image generator. • Take a look at LibraryThing and catalog some of your favorite books. • Roll your own search tool with Rollyo. • Explore Technorati and learn how tags work with blog posts. • Read a few perspectives on Web 2.0, Library 2.0 and the future of libraries. • Learn about wikis and discover some innovative ways that libraries are using them. • Add an entry to the Learning 2.0 SandBox wiki. • Take a look at some online productivity (word processing, spreadsheet) tools. • Discover YouTube and a few sites that allow users to upload and share videos. • Discover some useful search tools for locating podcasts. • Review the titles available on NetLibrary, learn how to download audiobooks. In the past three years there have been other technologies that have hit the market that also require knowledge and understanding among librarians. Most of this technology is “mobile” oriented. Michael Porter presented “Gadget Checklist 2010 for WebJunction, that included Peripherals, Mobile Devices, and E-Books and Digital Audio Books. The session is archived at http://www.webjunction.org/mobile-devices/-/articles/content/106452201, and reviewed at my Post of October 12, “21st Century Libraries Include “Gadget” Technology”. NOTE: I am not suggesting that ALL librarians must know or understand ALL of these technologies. What I am suggesting is that when 21st Century Librarians recognize a service need their customers have, they should know how to find out what technologies can fill that need and which (if any) will best satisfy their library’s mission. The important thing about librarians understanding technology is the application to fulfill a customer service. Past models proposed “customer service responses” (Sandra Nelson and June Garcia’s New Planning for Results) that presumably described the “core” library services. 20th Century libraries could pick and choose those service responses that met their community’s needs and incorporate them into their strategic plan. 21st Century Library models (of which there are no comprehensive ones) would outline the services in terms of delivery, as well as type, and customer segment. Delivery is a paramount concern in this new technology rich environment, where delivery was pretty much standard in previous decades – not too many alternatives – but, delivery options now range from traditional to digital to mobile, and who knows what in another 5 years. Also, services are now more specific to customer segments as well. A service for a Digital Fugitive customer would be very different for a Digital Native customer. It makes a difference! What other Librarian2.0+ technology skills would you recommend for 21st Century Librarianship? How’s that for a label for those “traditional” library patrons I referred to in my February 4 Post 21st Century Patrons – Greatest & Silent and again in the diagrams in my May 12 Post 21st Century Patrons – Revisited. Initially it seemed that referring to those senior individuals who have not found any particular interest, attraction or value in digital technology and mobile connectedness as “traditional” library customers was recognizing their right NOT to become “digital immigrants”. This group also includes those individuals who love their “brick & mortar” library with its ambiance and stacks and tactile attractions, and avoided technology as unnecessary and often intrusive. On further reflection (and in an attempt to include the term “digital” in each description), it occurred to me that those “traditional” library customers are choosing to avoid technology and the digital age, so therefore they are “Digital Fugitives”. A commonly accepted dictionary definition of “fugitive” as a noun states; “One who flees, or has fled; a refugee, or something fleeting or ephemeral. (The etymology is Middle English fugitive, from Old French, from Latin fugitīvus, from fugitus, past participle of fugere, to flee.) Sounds like those 20th Century traditional library patrons to me. So, I’m revising my diagram of library customers to include a description of the “Digital Fugitive” – “Not a digital immigrant, avoids technology in favor of a brick & mortar traditional library, the original 20th Century patron.” This includes a majority of the 35 million plus Great Generation and Silent Generation (66 and over), and some Baby Boomers. 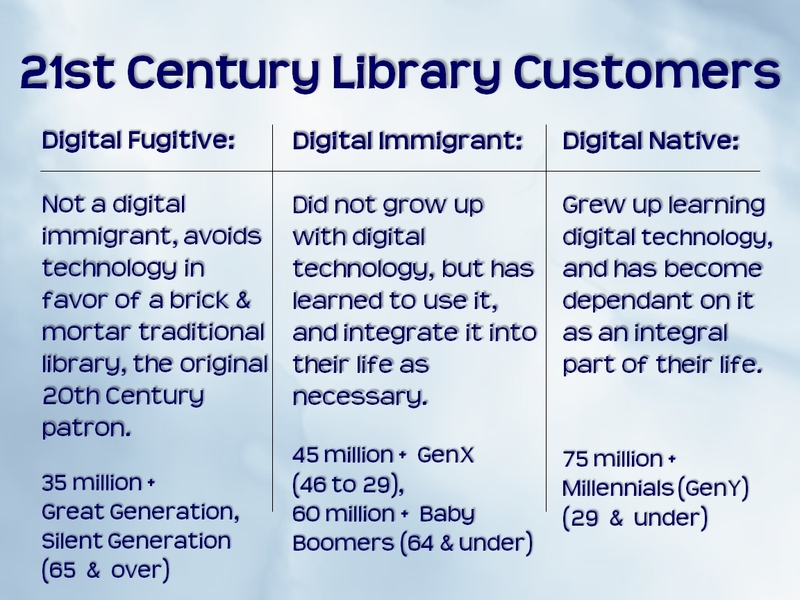 They represent a significant segment of the 21st Century library customer, yet there are many individuals in these generations who are “Digital Immigrants”. Due more to the growth of the “Digital Native” segment of the population, 21st Century libraries are required to provide a broader spectrum of services than the 20th Century library – more digital, mobile, connected. The large segment of “Digital Fugitive” customers must be offered services oriented to their needs, including technology classes for those interested in migrating to become “Digital Immigrants”. So, what do you think of the new category – “Digital Fugitive”?